It might have been a gift. It might have been a prank. 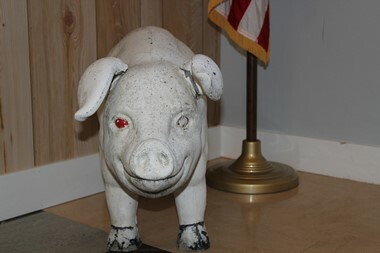 But whatever the intention was behind the concrete pig dropped off at the Astoria Police Department in the early 1990s, it has become a part of the family – and that includes restoration by the grandson of one of their own. 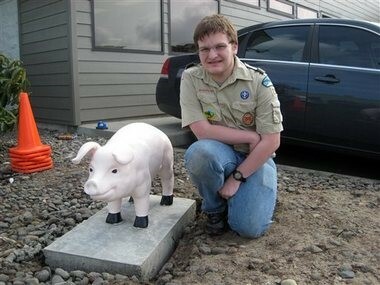 Michael Peden, the 16-year-old grandson of APD’s Administrative Services Manager Terri Peden, has chosen the pig’s restoration as his Eagle Scout project. The project took Peden three weeks, fixing the pig’s concrete surface, reattaching the ears, repainting the weathered animal to “a natural pink pig color” and enlisting the help of a fellow Boy Scout “with a steady hand” to repaint the eyes from red to black. The pig, originally pink when it was dropped off in the middle of the night, was never claimed, Astoria Police said in a press release this week. Despite its condition, police took the pig with them when they relocated to the Astoria Yacht Club, bringing the statue inside as a greeter. But when Astoria Police came back to their recently renovated and seismically retrofitted Public Safety Building, the pig – who does not have a name – stayed behind with Peden. The pig was restored in the northeast corner of the Public Safety Building space, near where the officers park their vehicles. “It now holds a prominent position at the entrance to the Police Department parking area, watching the comings and goings of police officers,” the press release stated. APD reports that since its 1993 placement, the pig has been photographed countless times. “It seems only right that we put it in a more prominent place,” the release said. **As a side note, the pig is behind a fence not because he was a bad piggy, but so it will protect him from children climbing on him.